Photographed from above it looks like a pool of melty Strawberry ice cream, but Lake Retba, which runs blood-red through Senegal, West Africa, gets its unusual color from an unusually high salt content—in some up to 40-percent! 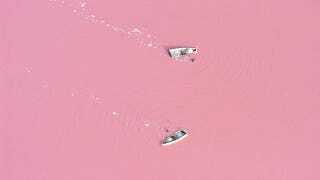 Microbiologist Michael Danson says that the water gets its candy-colored hue from the salt-loving organism Dunaliella salina (an algae). "They produce a red pigment that absorbs and uses the energy of sunlight to create more energy, turning the water pink," he told the Daily Mail.